"apprehending that for which Christ has apprehended me"
Live…Like Someone Left the Gate Open! November is the official start of the holiday season in our house – Thanksgiving is just around the corner and Christmas follows quickly behind it. 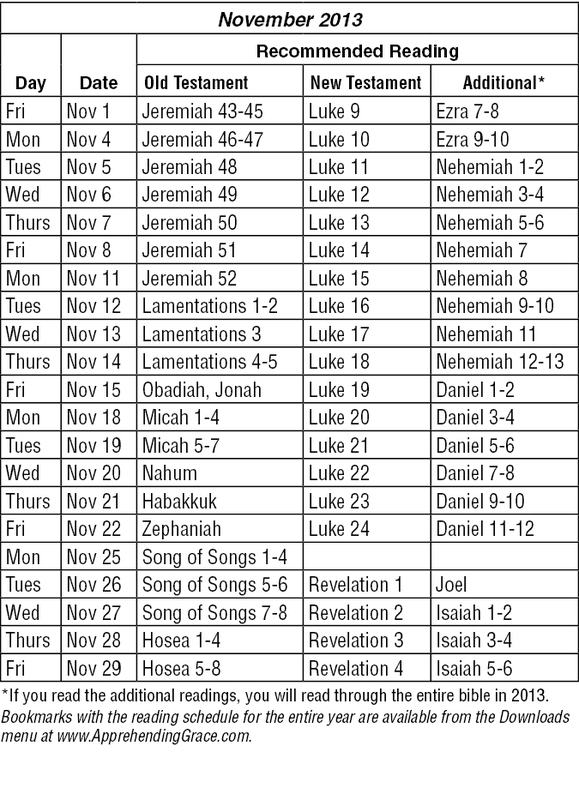 I love reading the book of Luke in November because it tells the Christmas story so well. It’s the book that will be our New Testament focus this month. Near the end of the month we’ll begin to read the book of Revelation – God’s final words to us. Our readings take us through the Old and New Testaments over a two year period. We’re winding up our two years this month and next, so here at Apprehending Grace we’re already thinking about our 2014 plan. If you have any thoughts about how you’d like us to organize the readings, let us know. Comment on the blog, send me an email or past a message on our Facebook page. The following buttons will open PDFs of the November/December bookmark or all bookmarks. After the file has opened, you can print it or save it to your hard drive from your browser’s file menu. Click here for the Sept/Oct 2013 recommended reading bookmark. Click here to download all bookmarks for 2013. The November Reading Schedule also appears at the end of this blog. Enjoy your reading! We’d love to hear what God speaks to your heart. Email me, leave a message on our Apprehending Grace Facebook page, or post a comment at the end of any blog. The recommended reading schedule for November is below. 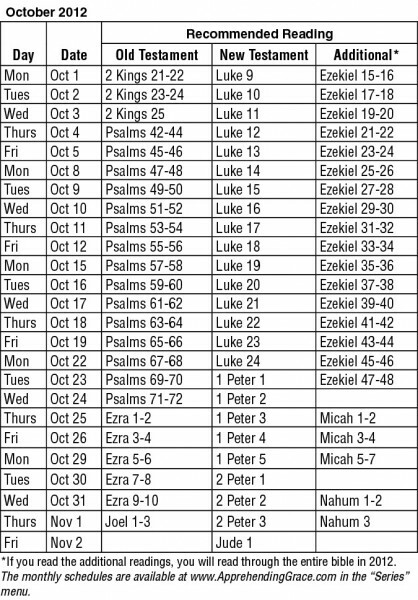 The first two columns of the schedule allow you to read through the Old Testament once and the New Testament twice over a two-year period. You will typically read about three chapters a day if you follow this reading plan. 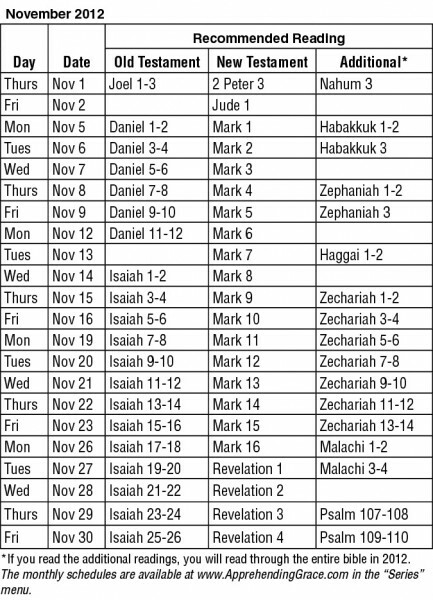 The “Additional Readings” column put you on a plan to read through the entire Bible in one year. You will read between four and five chapters a day if you follow this plan. Resting at the River’s Edge provides an opportunity to participate in reading through the Bible in a systematic way. Here’s more details about the plan and our schedules. The holiday season will quickly be upon us, friends. Let me encourage you to make a new commitment to continuing your time reading through the Bible. Track your reading along with us using the table below, the half-page PDF you can download here or the November/December Bookmark you can download here. Share with us what God is speaking you as you read this month! E-mail me, leave a message on the Apprehending Grace Facebook page, or post a comment at the end of any blog. Word of God, speak to us again this month! Track your reading along with us using the table below, the the half-page PDF you can download here or the September/October Bookmark you can download here. We’d love to have you share what God is teaching you. E-mail me, leave a message on the Apprehending Grace Facebook page, or post a comment at the end of any blog. 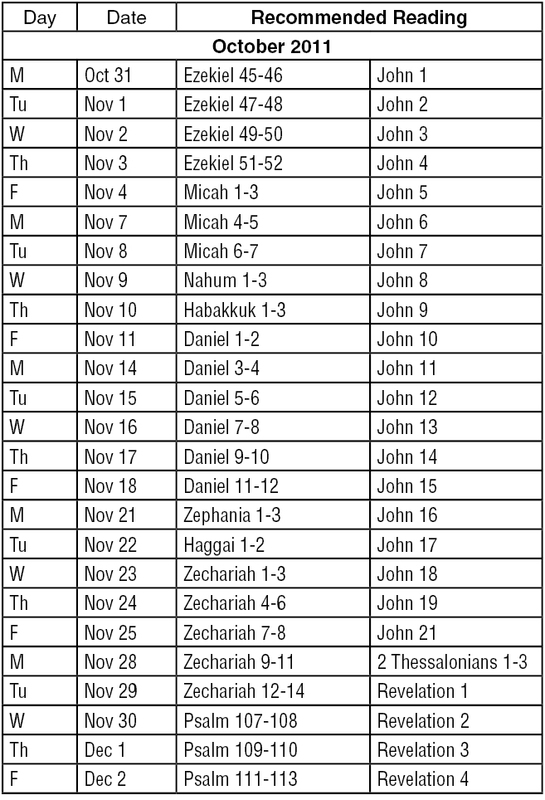 Word of God, speak to us this month! The Gospel of John is many people’s favorites. It’s a bit too contemplative to be my favorite, but I appreciate it’s uniqueness among the Gospels. LORD, I have heard of your fame; I stand in awe of your deeds, O LORD. Renew them in our day, in our time make them known; in wrath remember mercy. Though the fig tree does not bud and there are no grapes on the vines, though the olive crop fails and the fields produce no food, though there are no sheep in the pen and no cattle in the stalls, yet I will rejoice in the LORD, I will be joyful in God my Savior. Hold on to your hats, folks, there’s some fantastic reading ahead! 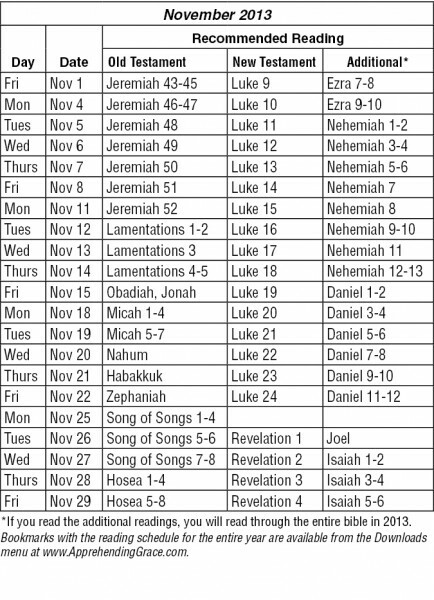 To download a PDF of the November 2011 recommended reading plan, click here.